Love these so much!!!! Very sturdy and look amazing!!! 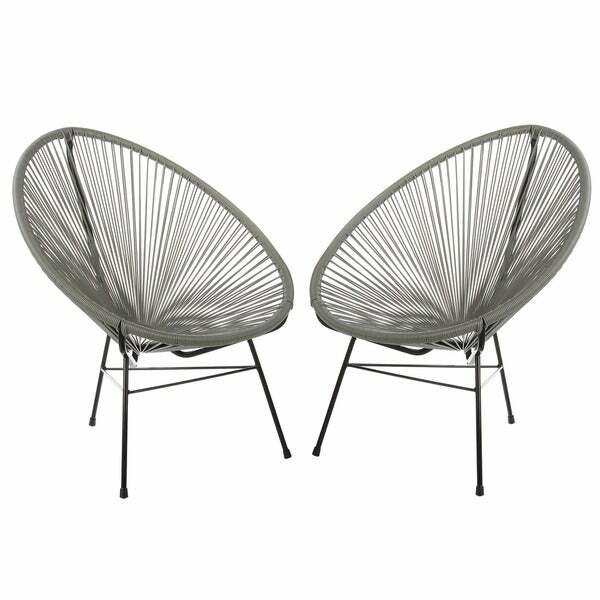 Based on time-honored Mayan hammock weaving technology, this basket lounge chair set unifies tradition with innovation and harmonizes the function of ergonomic comfort with retro-modern aesthetic form. These chairs are a little larger than most to be the perfect size and made with quality materials to give you a comfortable chair that will last ages. The artisans who make this stylish chair are skilled masters in the art of home furniture and decor. Both of these unique skills have been handed down through the generations. The result is that each handcrafted piece is a dramatic work of art in its own right. Making hand-made furniture and home decor is the livelihood of the Chinese artisans and they take incredible pride in their work. They are perfectionists and love to share their gift for all to enjoy. Dimensions 36.0 In. X 29.0 In. X 35.0 In. Been wanting a set of white Acapulco chairs for a while. Decided to give these a try since the price point has been the best that I’ve found. Overall, the chairs are of good quality and construction. It was very easy to assemble. Haven’t had any issues with paint chipping nor loose weaving. The chairs are also lightweight which makes them easy to move around. I have them in my terrace and so far they’ve worked great. Both my partner and I find them to be comfortable to sit in and haven’t had any issues. We’ve been using the chairs amolst everyday and are very pleased to have made the purchase. I would give zero stars if I could. This review is a year later. I bought these chairs and loved them! They were colorful, fun, and comfortable. I used them outside, on a covered patio. They were well cared for. Then one morning I went to sit down and noticed that the bands that hold the chair together had just popped and unraveled. And, not just one chair, but both!!! To spend nearly *** on two chairs and get only a year of use is ridiculous. Not to mention, that Overstock DID NOT back the product and did not offer any resolution. So in my opinion... DO NOT BUY THESE CHAIRS and waste your money. I am so disappointed. These chairs are great for the price. They add a modern feel to the patio and they are comfortable. The orange chairs add a super pop of color. They were very quick and easy to assemble and can easily be clean with a clothe or garden hose. I would recommend these. We bought these chairs after we saw them in a store in California. They are super comfortable and look great on our patio. My favorite thing about it is the color! This blue is perfect and totally complements the black and grey patio set we also bought from overstock. Great mid-century modern outdoor chairs that pop. Adds great color to my outside balcony. well made, such a pretty bright pop of color to add to our outdoor furniture. would purchase again!! The chairs are far less quality than represented. The base finish if very dull, and out of the box, was chipped and just by touch, more paint would flake off. The style is beautiful but quality is extremely disappointing and not up to serving outdoors. I give this 4 stars because it is as described. But these are not comfortable at all. They are in a play room for kiddos so its fine. But no one sits in them. Ouch. They are vibrant and comfortable. A fun addition to our deck. I put a simple metal table between them and it is an awesome place to relax. "Is the price of * for the set of two?" This purchase includes a set of two chairs. "Are the dimensions listed per chair or total per set?" The dimensions listed are for each chair. Ive sat in these chairs as a friend purchased the and they r the most comfortable and hip chairs ever! Hello lwc, thank you for your inquiry. Unfortunately, the information you have requested is currently unavailable. You will receive an email notification once an answer is posted. Have a great day.